CEWEP is happy to introduce new awards for its members in the fields of innovation, integration and communication! The winners were chosen by popular vote during 9th CEWEP Congress in Bilbao on 20th September 2018. ISVAG is an inter-municipal partnership treating the residual household waste of more than 1 million citizens in the wider Antwerp region, in Flanders, Belgium. What once began as an incinerator to reduce the problem of waste disposal & landfill has now become a valuable waste management site: ISVAG produces electricity for more than 25.000 households. Yet ISVAG is planning to build a new, state-of-the-art Waste-to-Energy plant by 2023, both aiming for the lowest emissions and the highest energy efficiency. ISVAG will be turning waste into electricity for more than 35,000 households or into hot water that will be sent to a nearby heating network for more than 40,000 households and companies. ISVAG aims to play an important role in the integrated waste management in Flanders. The Flanders region has an excellent reputation when it comes to sorting household and similar waste at source yet the remaining waste, that cannot be recycled in a technically or economically viable way, should be used to generate energy. In doing so, ISVAG is contributing to climate protection and security of energy supply, by replacing fossil fuels that would have been used to produce this energy in conventional power plants. Communicating the benefits that Waste-to-Energy brings to the environment and society is crucial in creating support and achieving public awareness among the wider audience, both in Antwerp, Flanders, and internationally. Hence why ISVAG – among other means of communication – has created a corporate image movie both in Dutch and in English, ‘Samen slim’ (Dutch) and ‘Smart together’ (English), underlining that sustainable waste management is our common responsibility in achieving a climate-neutral metropole by 2050: the ISVAG movie is being actively shown to the wider Antwerp population and to a broad range of stakeholders, both nationally and internationally. Carbon dioxide (CO2) emissions are a major cause of global warming, which has drastic effects on our living environment. It is important to find ways of capturing the CO2 and find good utilisation for it. Twence uses sodium bicarbonate (NaHCO3) in its WTE-plant for flue gas cleaning purposes (removal of acid components). In collaboration with other parties, Twence developed an innovative system for capturing CO2 from the dry flue gas treatment of one of the incineration lines, to use it as raw material for producing NaHCO3. It is a small cycle of significant environmental importance. The system is fully integrated in the plant and produces approximately 8,000 tonnes of sodium bicarbonate annually. This amounts to a reduction of CO2 emissions up to 3,000 tonnes per year. The knowledge gained by developing this system is highly valuable for Twence and for others, as it is shared through conferences and publications. The project is supported by the provincial and the Dutch government as well as the European Union. There are many new and useful applications for carbon dioxide. Recovery on a larger scale will help us take the next step in reuse. Therefore we initiated the development of a large scale CO2 capture plant that we expect to start building in 2020. In this project again, we strongly focus on the reuse of the CO2. We work with other parties on the development of sustainable construction materials and e-fuels with a CO2 base and the supply of CO2 as a fertilizer in greenhouses. For more information about this project, please visit the project website co2sbc. In the Antwerp Port, INDAVER, in conjunction with public and private partners, is building a network through which steam will be delivered from its 1 million tonne/year Waste-to-Energy plant to nearby industry. The energy for the network is produced by INDAVER and SLECO’s Waste-to-Energy installations, with six incineration installations producing 250 MW of steam. Approximately half of the waste that is processed here is bio-organic. Therefore half of the recovered energy is considered ‘renewable’. The project, titled “ECLUSE”, French for ‘sluice’, has the purpose of replacing the current fossil fuel-based energy supply for a number of large-scale chemical companies by steam at high temperature (400°C) and pressure (40bar). Once ECLUSE is operational, it will supply at least 5% to 10% of all green heat produced in Flanders. It will also ensure enormous CO2 savings of at least 100,000 tonnes each year. This is similar to the CO2 savings achieved by 50 standard 2.3 MW wind turbines. 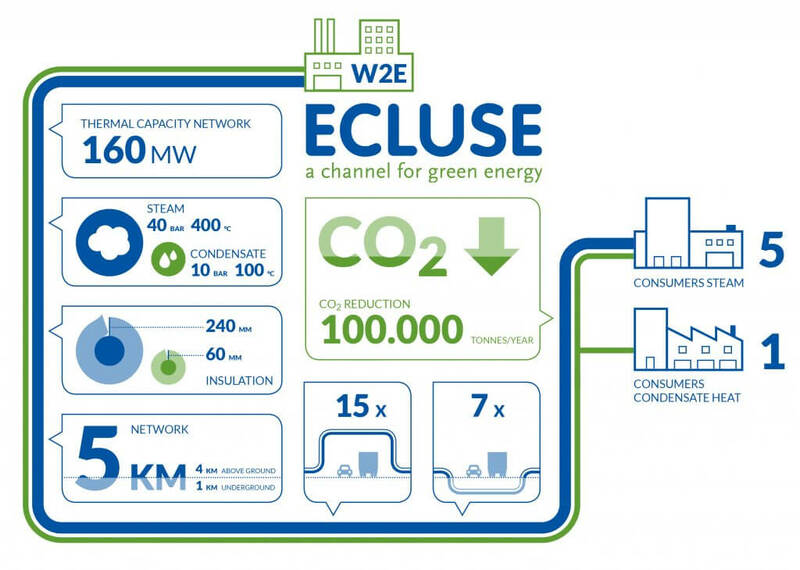 ECLUSE is to become the largest industrial steam network in Europe. The network can further extend to other companies, which would lead to savings up to 200,000 tonnes of CO2 emissions. This large-scale project was awarded a €10 million subsidy by the Flemish government because of its strategic importance. It offers social, ecological and economic added value for the region, ‘anchors’ the chemical industry in Flanders and increases the sustainability of the chemical industry in the Antwerp port. ECLUSE will give the Flemish climate targets a major boost.